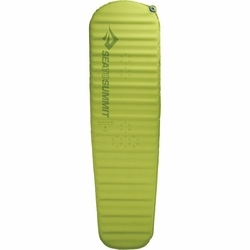 Sea to Summit Comfort Light SI Mat. The Comfort Light series aims to hit that sweet spot of minimal weight and packed size but also offers great comfort. At 2 inches, this mattress is going to protect you from just about any less-than-perfectly flat terrain. The Delta Core™ technology makes sure that the additional thickness doesn’t equate to an increase in weight and provides even insulation across the length of the mattress. Features our patent-pending multi-functional valve. High flow rate for easy inflation; one-way deflation mode prevents re-inflating while packing up and fine-tuning bleed valve for customized comfort. We use a lightweight plain-weave 30D polyester fabric top and bottom. Anti-slip silicone print on the top and bottom fabric helps keep your mat in place. With an insulating equivalent R-value of 2.7, the Comfort Light Series is an excellent option for all but the chilliest winter camping trips.